"...I had to call 'Bron and tell him, like, ‘I apologize for being that young player that wanted everything at his fingertips..."
Everyone does stupid things when they were younger, you just hope it’s not too bad and that you learn from your past and change for the better. When Kyrie Irving started his career with the Cleveland Cavaliers, he felt he was the star and leader of the team. But when LeBron James signed with the team, he had to step aside while LeBron lead the team to a title. Eventually, Irving left the Cavs to sign with the Boston Celtics. And now that LeBron is with the Lakers, both people are trying to lead their respective teams to prominence. While in Boston, Irving has had to lead many young teammates and maybe that sparked some past memories when he was in their shoes. That maybe he was a bit too hard on LeBron when he was just trying to make the team better. Irving revealed Wednesday night that he recently called LeBron to talk about leadership and apologized to him for how he acted as a teammate. It’s some notable personal growth for Irving to realize what he did and apologize for it. It’s kinda like the teenager who never listened to their parents and then when they got older, realized that they were actually right all along. 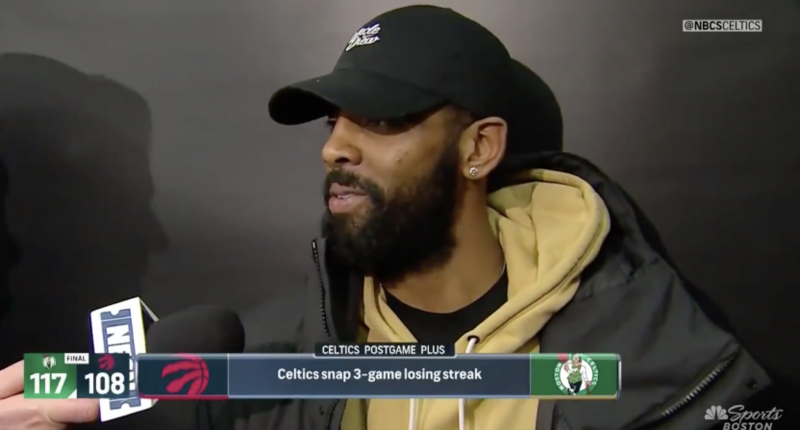 In addition, it’s possible that by publicly revealing this story, it’s a subtle call to Kyrie’s younger Celtics teammates to listen to him because he certainly knows what it’s like and just wants the team to be successful.